Bruce Willis appeared on Jimmy Fallon, where he mocked his hair. After the fun and games, Jimmy Fallon asked Willis how he felt about President Trump. Fallon felt like Willis might have been kidding, and ask him if he was being serious about his answer. Fallon likely didn’t believe anybody would actually admit to liking Trump. Keep in mind that Fallon himself has taken quite a bit of criticism because unlike other late night comedians, he won’t simply go after President Trump for canned laughter. As for his comments about the president perhaps being the greatest president, Willis responded. 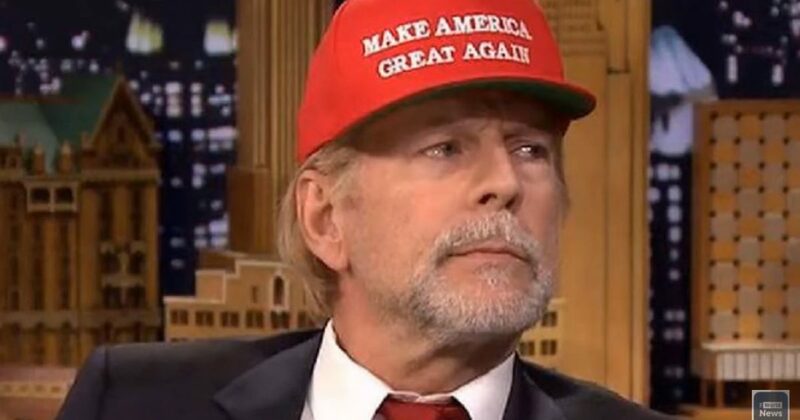 Willis is a known Hollywood Conservative, and it is refreshing to see an actor of his stature publicly declare his support of the president. I’m not sure if many other actors have the guts to do what Willis did, but you know many people cheered Willis’ comments. Perhaps Willis’ strongest words came to this who opposed Trump and thwart our political system. I suspect in a year or so many more Hollyweirdos will join Willis in his sanity. Also, this epiphany will occur to many others. In fact, I believe it already has, as we have the clues. I’m on record saying that 2018 will be another Republican sweep of the mid-terms. And 2020 will be a walk in the park for President Trump in his bid for re-election.